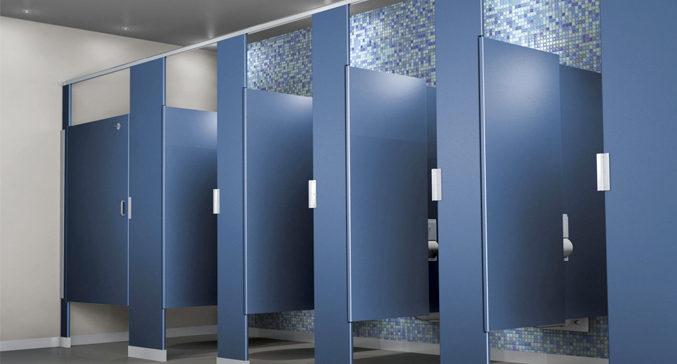 At partitions and stalls we want to earn your business for all your commercial restroom needs. We specialize in complete remodels to partial make over’s. We are your One Stop Shop for all your bathroom products. We are currently offering a 10% discount on our website only - use "APP" as the coupon code during checkout. This will allow our customers to receive ten percent off all of our products. Partitions and stalls is dedicated to help every customer that visits us. Please come see us today. Toilet partitions ship quickly and are delivered within one week or less from most manufactures. We work with thirteen partition manufactures in the United States which helps our customer’s save time and money with having factories closer to their locations. All partitions are made to order for each customer and are not returnable. We offer many different material choices to our customers with options of no-sight which includes continuous channels and full length door stops which will have more privacy in the toilet stalls. We also offer over sized doors and panels if desired for extra privacy. Below are links for different material types and items like doors, panels, pilasters, privacy’s and complete partition stalls. Commercial bathroom accessories typically ship from the factory and have a lead time of 1-2 weeks delivered to anywhere in the USA. We work with American specialties, AJ Washrooms, Palmer Fixture and Bradley Mills. Partitions and stalls stock all partition parts for same day shipping. Finding replacement parts for partition doors please see below by manufacture. All partition hardware brackets, piano hinges, surface mount hinges, keepers, slide latches and pilaster shoes are common with most factories. If you are have trouble locating certain parts please email us pictures to determine if your part is still available. We also carry most restroom accessories available. Most items ship in 48 hours and are delivered in one week.